There are just two small differences in the filling, being the addition of lemon juice and skipping the corn flour. Take two tsps of oil in a pan and saute onions until it turns transparent. Add the chillies and ginger and saute for a min. 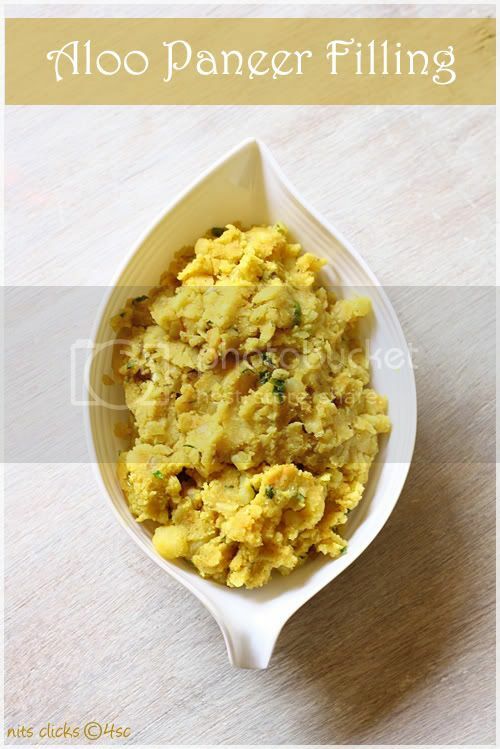 Drop in the mashed potatoes, grated paneer, salt, turmeric powder and garam masala, mix well and cook on medium flame for 3 to 4 mins, while stirring continuously. Simmer the stove and add the lemon juice and mix well. Aloo paneer filling is ready. 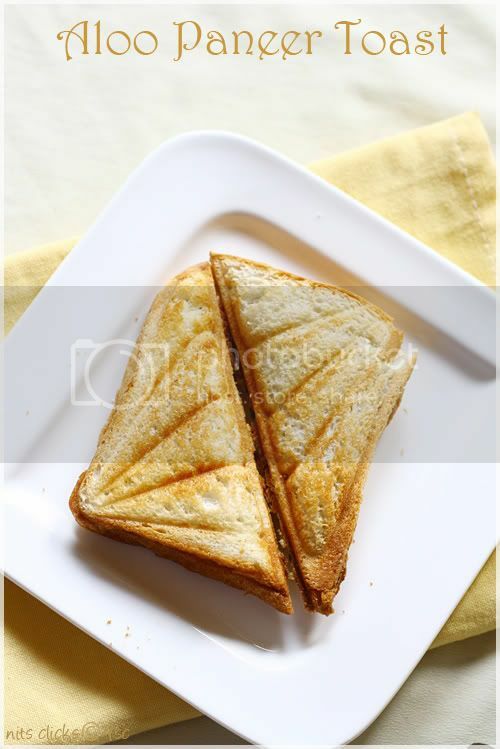 Apply butter on bread and sandwich two slices with a generous amount of aloo paneer filling. Toast them using a toaster until golden brown. I would say only you are your competitor in taking awesome clicks!! super filling for the toast, i make a similar filling for parathas, Making in bread sounds a quick and easy one. very yummy filling n a great breakfast idea too...no words to say about your pictures...awesome n i became your fan too...great clicks!!! Wow! 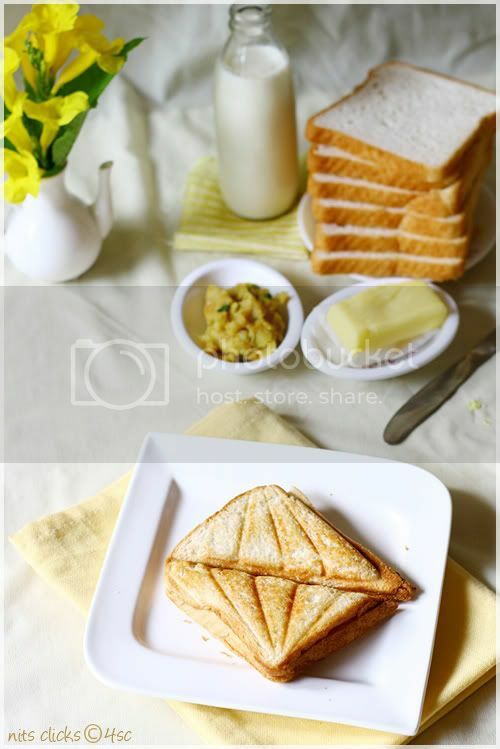 ur toast is make me hungry:) nice snaps. Superb pics and a yummy recipe. slurrrrrrrrrp! 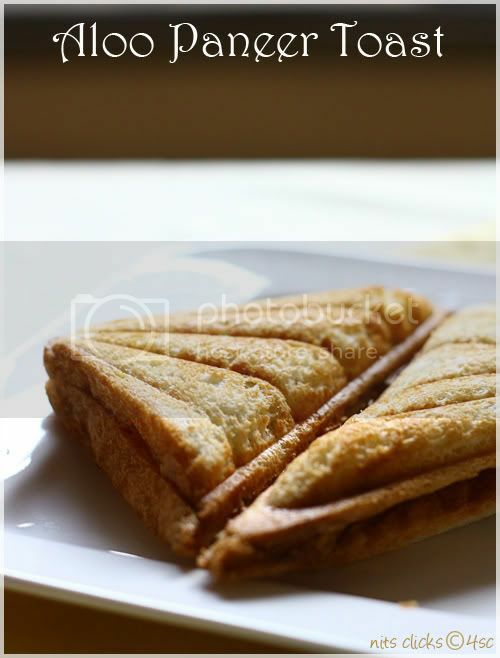 please pass on the toasted sndwich to me fast since I feel so hungry looking at it. super filling n lovely clicks!! 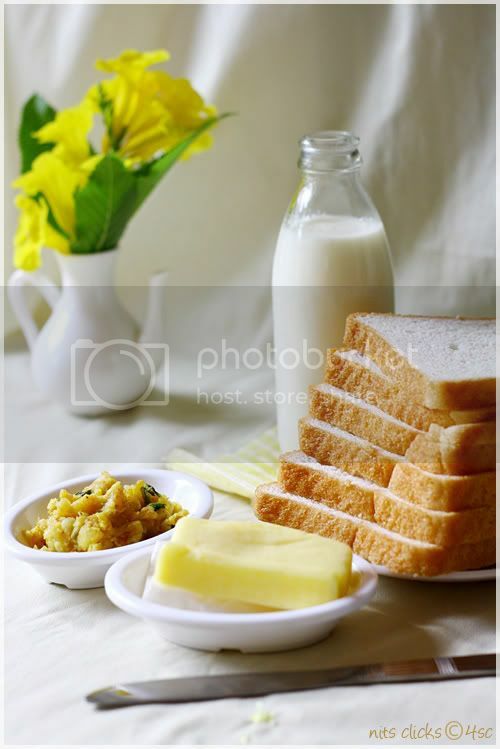 wonderful recipe, the toast looks simply superb, excellent clicks..
You have a very lovely blog. Pictures are making to grab the food. :-) Love your blog. Love the way you are experimenting different lighting...eps I loved the second one looks gorgeous! Loved all your shots, styling ~ everything! I second Krithi when she says 'only you are your competitor'. Great job dear. I'm especially a great fan of your photography and presentation skills. Your clicks steal hearts!!! Aloo Paneer Toast is looking great. 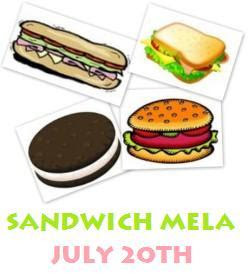 why dont you submit this to Srivalli's "Sandwich mela" ? here is the link.. Loved the filling and beautiful clicks. yummy filling! Excellent presentation n clicks! Ahha Nithi,loved ur toaster dear...filling sounds gud...I just loved it. 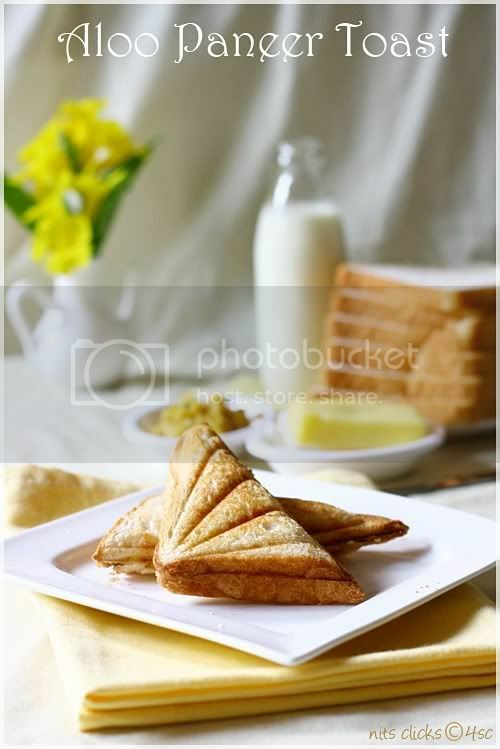 wonderful clicks and the toast looks mouthwatering. Nits, excellent and amazing photography. Where do you get all the ideas for each snap, like from where the light should come, what props can be used and so on. You rock gal. Loved this a lot. Yum..need one for my morning breakfast! I'm always looking forward to your posts and enjoy your creativity in styling and your choice of color themes. Honestly you never disappoint me! 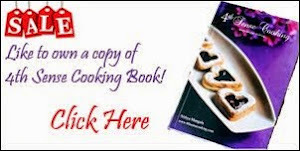 I also love the simplicity of your recipes... :) Spaces like yours makes browsing the net a great pleasure! Sandwiches look yummy. Your toast is simply awesome. Great use of potatoes and paneer. I love the photos too. Pictures are simply superb Nithi! love them..thanks for sending them across..